Missed off the score for campsite Panorama du Pyla: 9/10- fantastic location at the end of the Dune and a lovely viewing area overlooking the sea for evening drinks. Only downside it was a bit dog eat dog finding a pitch, as there were no defined areas -some large some small dependent on the placement of the trees and the tenaciousness and skill of the drivers. We managed to set off just before 10.30 am - a Tree record! And that's after a full english breakfast ! Just before we set off we were mesmerised by the arrival of a large german plated motorhome, with teutonic efficiency the male driver measured out his pitch with the aid of a small spade and spirit level, steadfastly refusing to be hurried as other campers waited to pass in their cars. After marking out and confirming the suitability he reversed the monster van into the selected pitch. Even the german couple in the pitch next to ours looked on in awe! 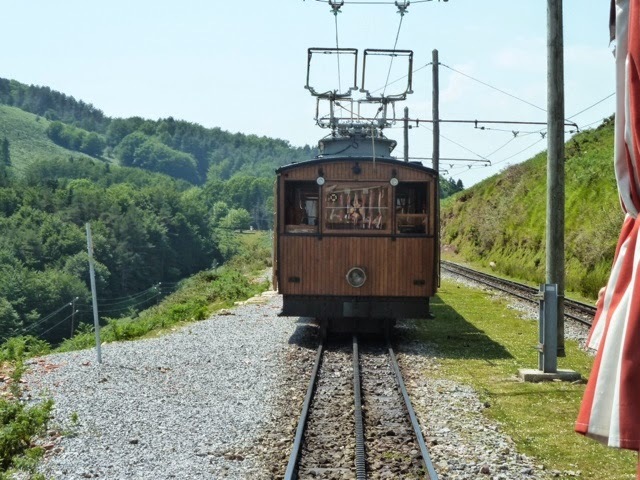 An option was to get to Biarritz in a day, but we don't do high speed dashes on our beloved D roads, so we again set off at a steady 45-50mph. Graham has a rule: when we are holding up 3 or more cars we pull over to let them pass. 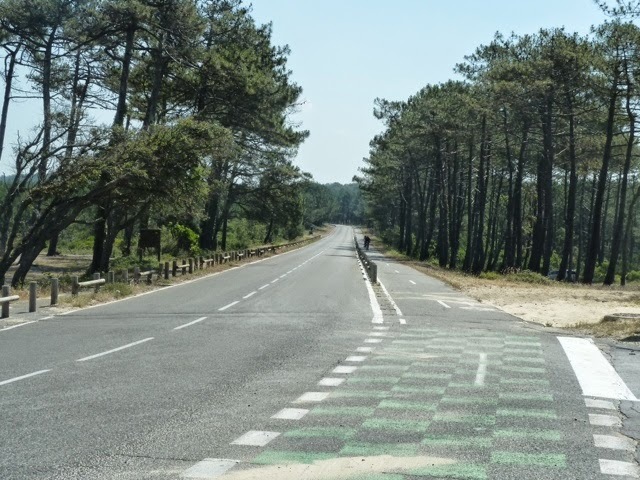 Travelling through the Landes forested areas is a little boring - lots and lots of trees, straight roads, and no hills, none! 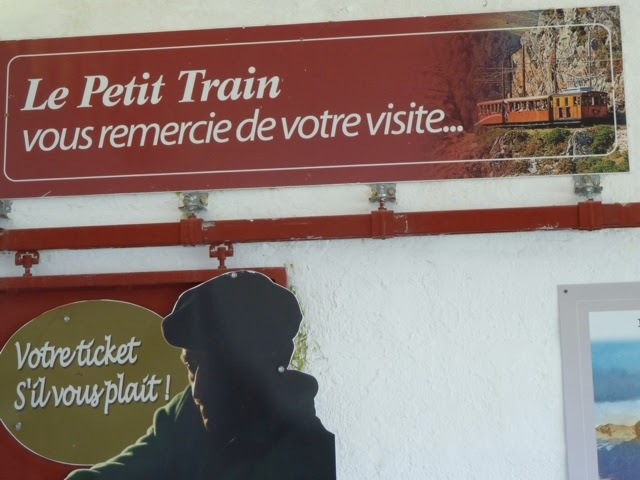 However, in between the forested areas and turnng off the road are lots of small villages ready to spring in to action come the french holiday season. 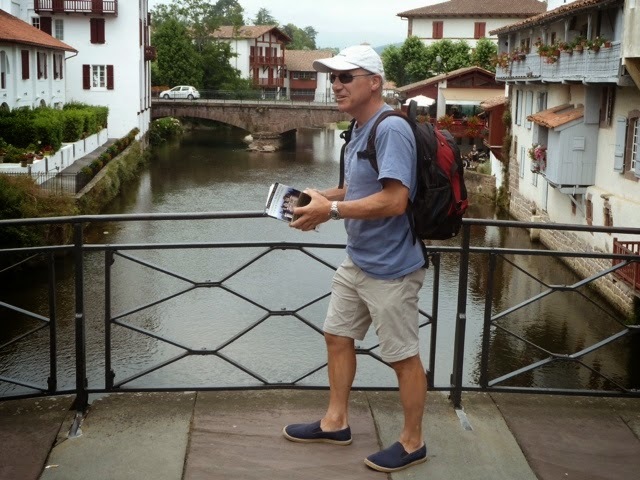 We thought we should try one, and after a leisurely diversion for a lakeside pique-nique by a lovely small lake at Aureillon, we are not in the mood for bustling Bayonne. Léon is the village we chose. From the lake you can travel in a punted flat boat along the waterways on the Huchet river all the way to the coast (4 hours). Obviously by the time we arrived the boat trips were fermé! We knew the campsite in our Michellin guide in Leon was expensive -45 euros -so drove further on to find a campsite nearer the lake for just over 17 euros - a great find - Camping Club Lou Puntaou- it was being readied for next month but the lovely pool was open, which we enjoyed later in the pm, almost to ourselves. For those wondering what happened to the sliding doors - Graham effected a repair using sticky tape which we will live with until we return to England. What a hero! [Because the nyon runner had come off, the rolling mechanism was too low, so I built a ramp out of sticky tape to launch it to the correct height, and also adjusted the clamps so it is lower]. Score for Camping Club Lou Puntao - 7.5/10 - great pool but most other facilities not yet in operation with an air of slight neglect, including most showers. Also lots of little flies around determined to commit kamikaze in Carol's early morning coffee! Have you ever looked at a map of France and seen the thin line of yellow running from the tip of the Medoc to Biarritz? Well I have and I wanted to see what it looked like in the flesh. Here it is: over a hundred miles of soft sand, mostly deserted apart from a few access points. 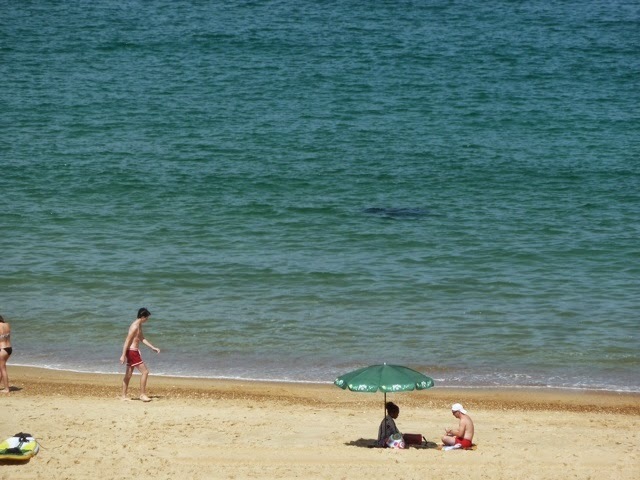 Occasionally you could see dark patches in the ocean, scaring the bathers and only 5 or 6 metres from the shore. They turned out to be shoals of little fish swimming randomnly in a group. You may be able to make one out in the photo below. 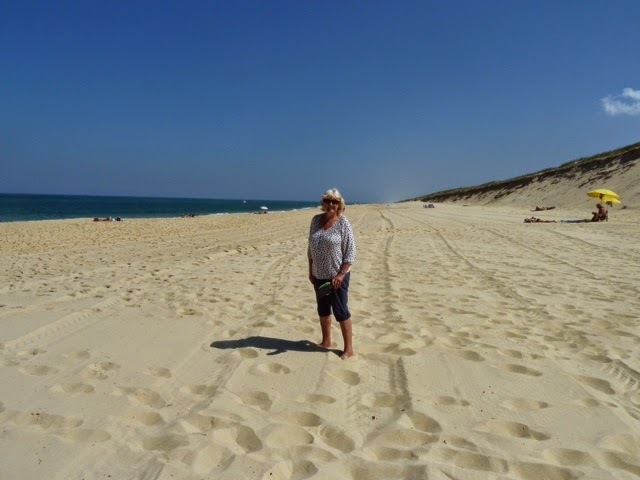 On route to Biarritz we stopped for a picnic lunch in Capbreton- Carol had read it was an iconic place to visit- with a famous wooden pier and lighthouse. Graham was underwhelmed -he thought he was going to see a proper big lighthouse -not a tiddly looking thing at the entrance to the harbour and marina! However a plaque said the pier was built in 1850 something for William III. 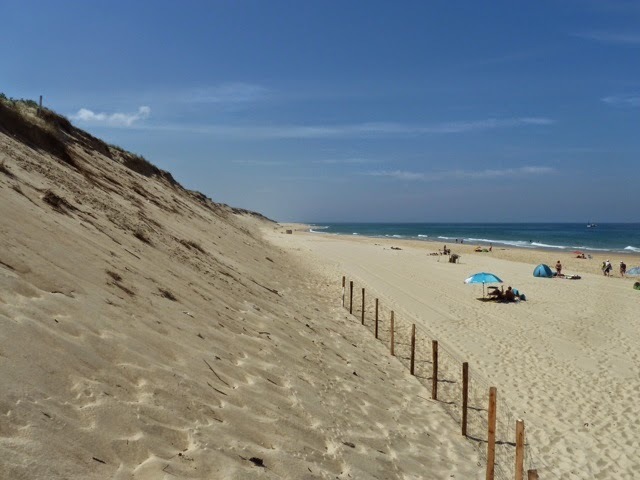 Capbreton looked like it had been flattened and rebuilt. Large appartment blocks around a huge marina, but still a working harbour with a number of fishing boats returning with the day's catch while we were there. 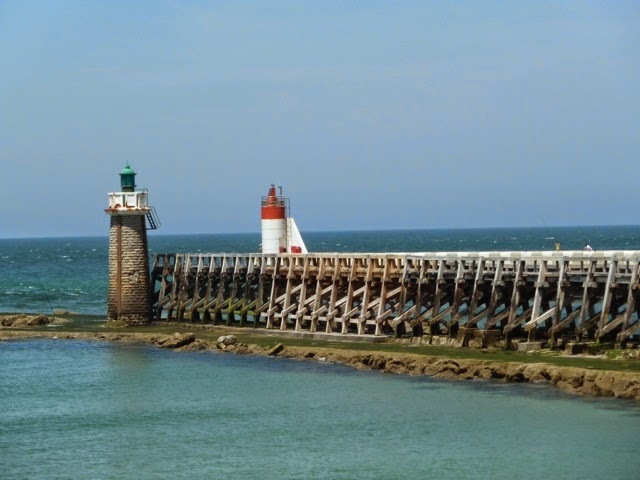 The old pier at Capbreton. This is now the harbour entrance and they've stuck the starboard marker on the old lighthouse. 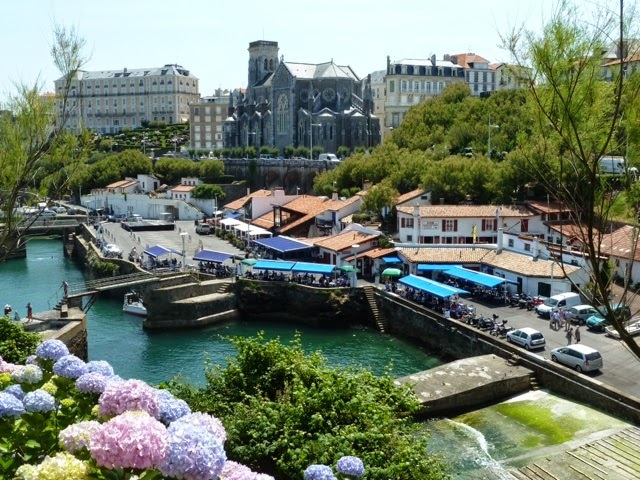 Travelling further through the Landes forest there were several sweet looking villages until we met the busy conurbation that was Bayonne, Anglet and Biarritz which seemed to roll into one. A rude awakening after our gentle pottering. 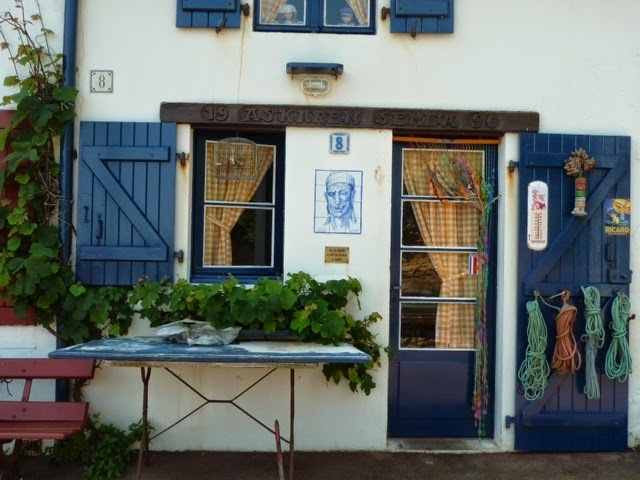 We are staying to the south in Bidart and we missed our campsite twice before we found it on the avenue de Biarritz - at one time trundling through a residential area with a no camping car sign! The campsite is fantastic - already feels like a 10\10 - we quickly changed and headed for a welcome dip in the pool. The site is delightful - lots of trees .hydrangeas and roses separate the pitches. The showers have piped music- how swanky is that! There are also many lodges in the site. Tonight we will venture up to the bar to watch the agony that is supporting England in the 2nd World Cup qualifiying match. We sat with the handful of apologetic Brits in the bar to watch the match. Oh dear. We don't seem to be able to concentrate for 45 minutes at a time. We shuffled off after the inevitable defeat-Graham commenting "even Nelson (our deceased labrador) would have had the nounce to man mark Suarez". June 20th, day 19. 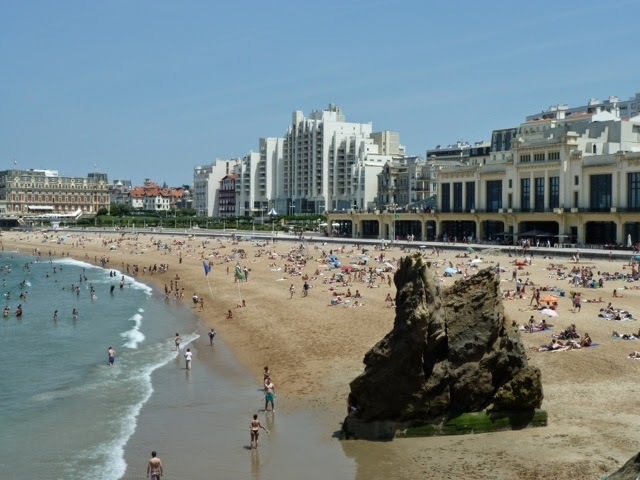 Biarritz. Today we caught the bus to Biarritz. Graham has always wanted to see what it looked like -after reading accounts of it's Art Deco splendour. Again the fare was 1 euro per single journey and 2 euros for a 24 hour ticket- a bargain! The promenade along the beach was sophisticated and tasteful - with the Hotel du Palais at one end of the bay, the Art Deco casino in the centre and some other grand building at the other side. We peered over the hedges and up the drive of the Hotel du Palais -once the imperial residence of -yes you've guessed it -William III. We noted lunch cost €135 euros, with another €22 for pudding. We decided we would rather like a more authentic experience in a restaurant in the old fishing port -that and we were a little underdressed and under resourced! We were a little disappointed that there were not many cafes and restaurants along the promenade as we had imagined something like the cafes on the Champs Elysees in Paris! However the beach itself was delightful -we really regretted not packing our cossies and towels! 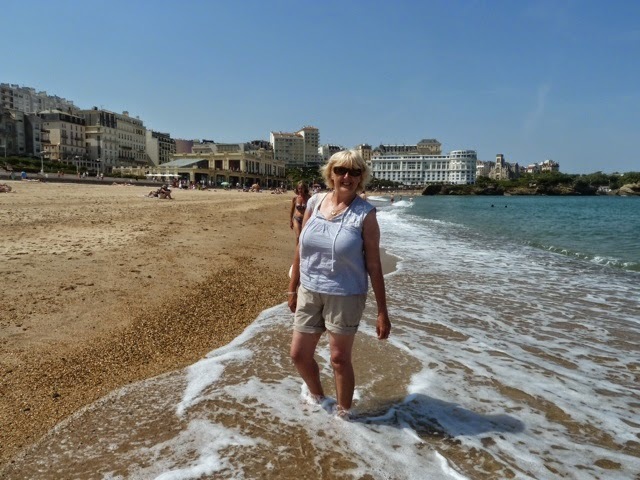 We did paddle along the edge of the sea along the Grand Plage - Graham manfully trying not to stare at the thong wearing girls and Carol trying not to do the same with the lifeguards. After exploring the other sites including the Rocher de la Vierge -a rock connected to the promenade by an iron walkway built by Eiffel, the fishing port and further beaches -we had lunch overlooking the old fishing port at a fish restaurant -Thon (Tuna) avec Piperade and Merlu (Hake) a l'espagnol, half a carafe of rosé,and 2 coffees; €41. That's more like it. The beach fills up in the afternoon. More distracting thongs! After another stroll along the Grande Plage - the heat began to get to us and we decide to return to Bidart and hit the pool. Later we went to the bar to watch France vs Switzerland. Another pasting. The bar packed, faces painted, staff all with French footie kit on complete with whistles. Whenever the French scored a goal all whistles were blown enthusiastically complete with music and clapping in time - 5 times we experienced this! Needless to say the mood of the departing supporters was a little more upbeat than the previous night. 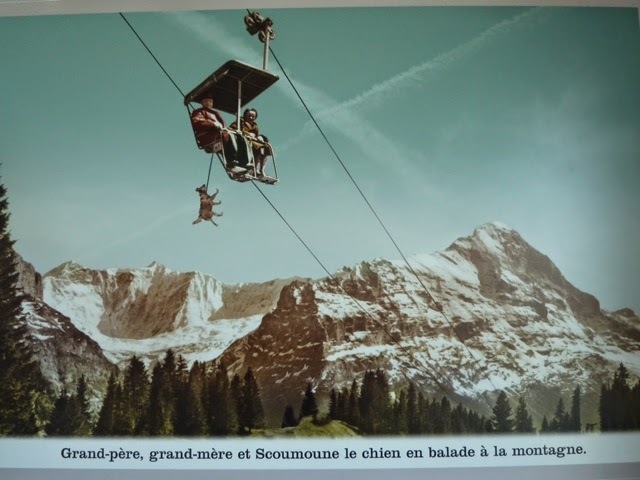 On the way back we mused how timid England would have fared against Switzerland. Through the later part of the match we heard thunder and saw sheet lightning -and in the night there was another dramatic thunderstorm. Score for camping Yelloh Illbiarritz. - 10/10. Although sometimes we could hear the main autoroute -it did not interfere with our enjoyment of this well equipped site. Great shop, bar, restaurant,tennis court, children's activity area -pools - we saw the large indoor pool as we drove to go out! In fact we noted there were some Thomson lodges signposted on the site. We were going to stay another night in Bidart but last night the pitches surrounding Rex were taken by a group of Spanish families with their very lively excited children! Something to do with a King being crowned may have given tham an extra holiday. They were still up eating and chatting as we arrived back just after 11pm last night and up and at them this morning ready for day of poolside fun! Our proposed day of chilling by the van and pool was just not going the happen. 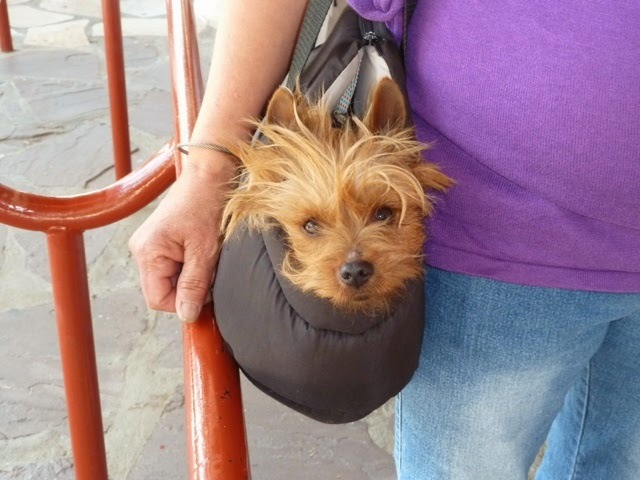 A canine passenger cost 8 euros - not sure if this one was declared. 905 metres up. 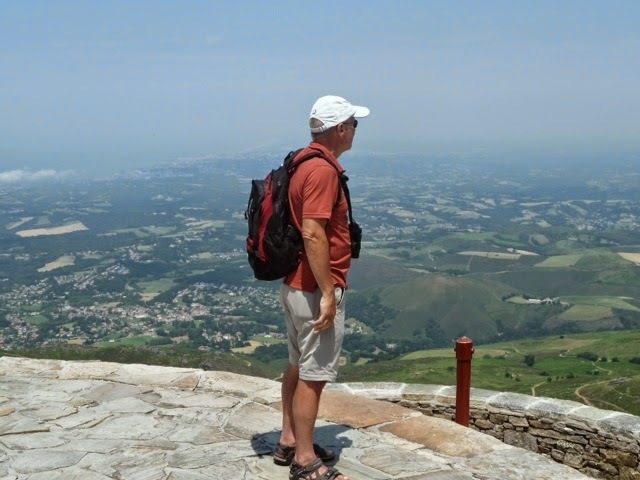 Biarritz is in the distance, but I don't think you can see it on the photo. 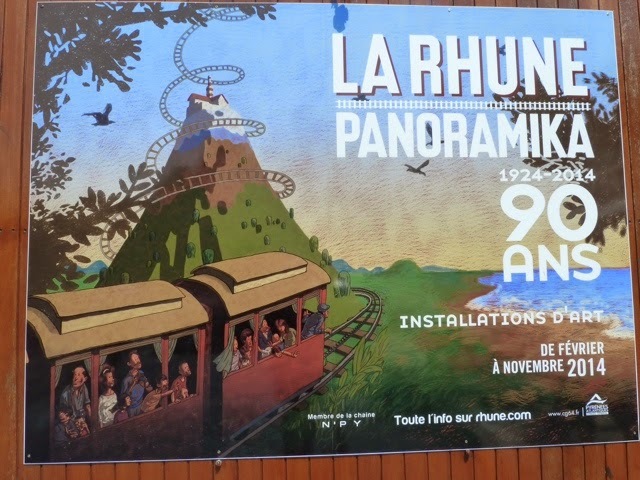 The train celebrates it's 90th anniversary this year. We stopped over at a campsite just outside of the village of Espelette -famous for it's sweet red peppers - Piment D'Espelette. Again on arrival we hit the pool at camping Bipar Gorri. Later that night "les gens du village" gave an impromptu concert in the bar to round off a local party. We gate crashed with a couple of beers. Score for camping Bipar Gorri -8/10 - lovely pool area and friendly bar. Toilets and showers unisex-they're in individual cubicles but Carol was a little shaken by having to walk out of the showers passing the men using the urinals just outside! 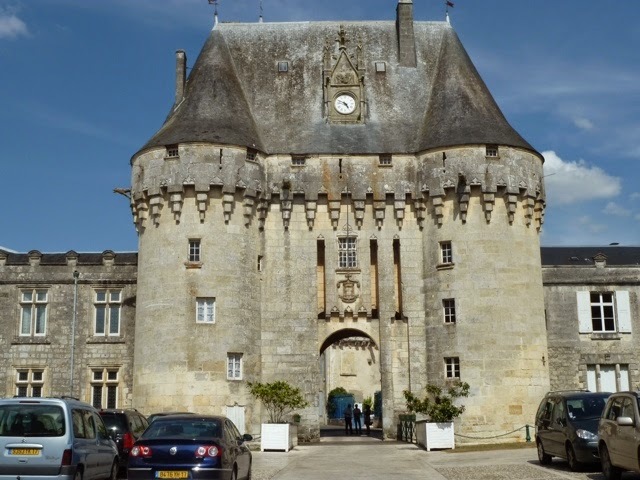 Tomorrow we aim to travel to Salies -de- Bearn just to the North west of the Bearn region and probably stay a couple of nights. Espelette is a manicured tourist town with day trippers just arriving as we leave. 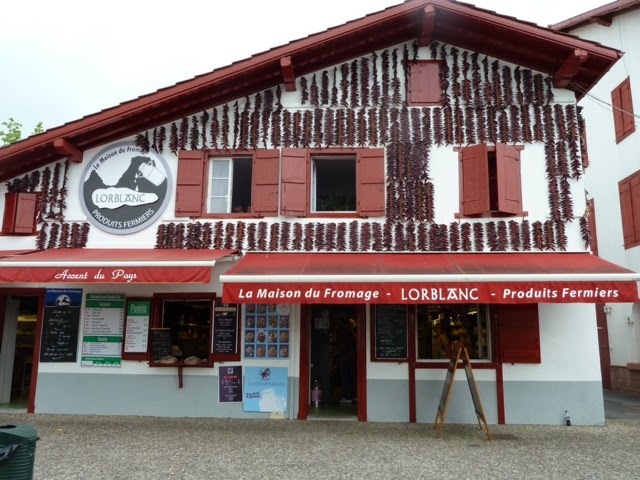 Lots of quaint charcuteries, tourist shops and produits regionaux, and yes, chocolate shops selling...you guessed it: chilli chocolate. 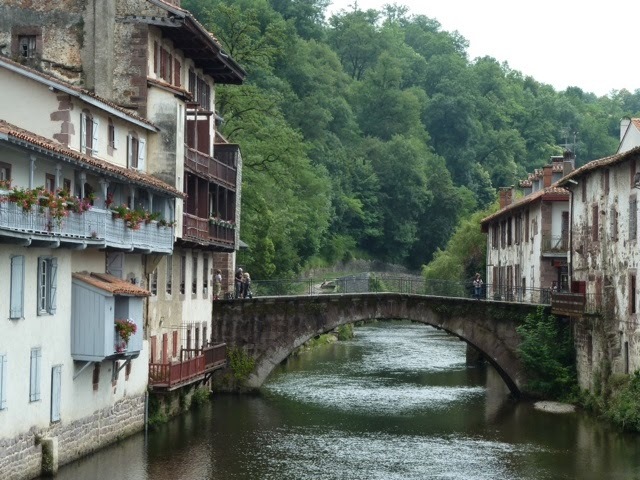 Carol fills her boots and empties her credit card in one of them before we set off for St. Jean Pied de Port. Lots of the shops and houses have rows of peppers dangling down them. 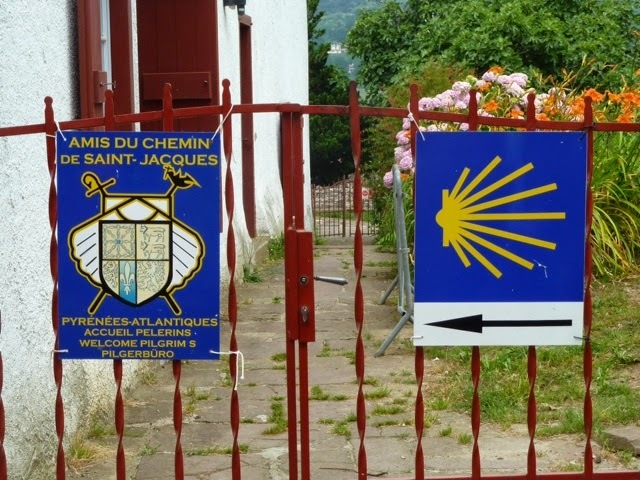 30km later, St Jean Pied de Port is the final stopping off point for pilgrims on the road to Santiago de Compostela before the dangerous climb over Pyrenean passes. Todays pilgrims follow the same route with backpacks over the bridge below. 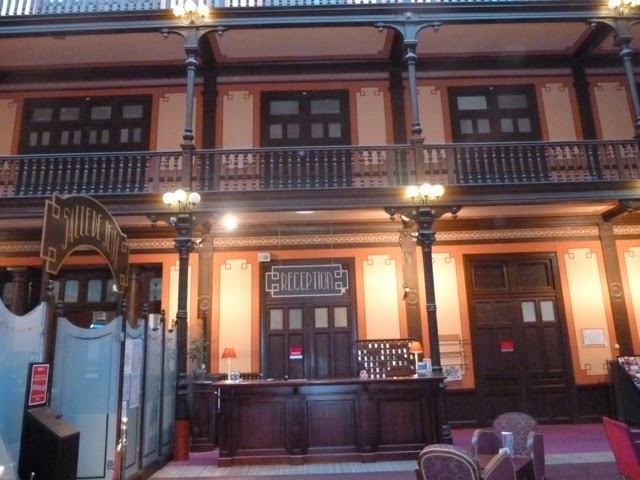 If you have the right credentials you can stay (free) in one of the offered resting places in the old town. And the view of the same bridge from he opposite side. A couple of the places offering refuge to pilgrims. Having picnic lunch we head North into Béarn and head for Salies de Béarn municipal campsite. 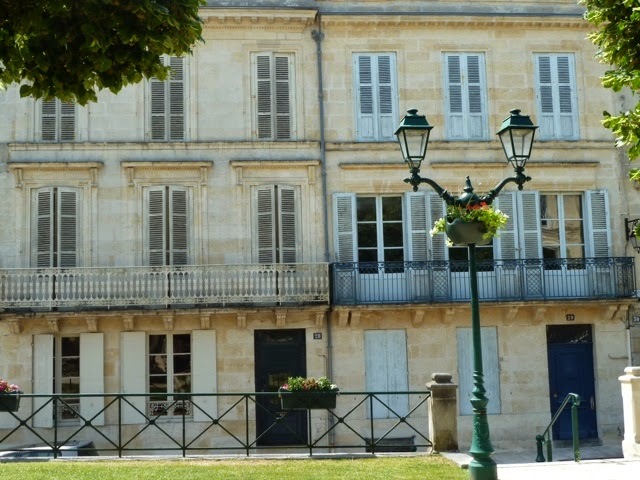 Salies de Béarn is an ancient spa town with a nice park and grand hotels (if just a little run down). It's Graham's birthday so we head for the grandest and book a table for dinner in the Hotel Casino. (Actually, it's the only one that's open). Unfortunately the lights were broken -so here's the Ino Hotel! Hotel Casino is an original art deco dream of a place! - original chairs and lightfittings etc. We ate on the veranda - which had a glass roof and original metal light fittings and metal decoration. This is the inside. We had a great meal (John Dory with oranges/Cod and chirozo) which was again very reasonably priced. We assumed dining out in France would be expensive but we find it the contrary. Today, as the cruise brochures state, is a day relaxing at sea. We need to get north of Bordeaux in one go so we go by autoroute speed rather than D roads. The N10 is packed with lorries from all nationalities. The rightmost lane is just one long convoy, leaving two lanes for the rest. Route is marked as a freebie but the map is wrong: there are two péages and we hit them both. Today is also the first day of rain since Noirmoutier. We have not experienced any wine or cognac tasting so decided to stop over in Jonzac, just 12kms south of Pons, where we stayed a fortnight ago. It feels good to be back in this area. This is nice gentle countryside with vines and quiet roads. We decide to stay a couple of nights to have a rest from touring and chill a little. We are staying at a friendly rural site called Les Castors - it has small indoor and outdoor pools which we take full advantage of once settled on our pitch. Again we think we are the only English on site - often hearing snippets of comments between fellow campers re "les anglais". Graham whilst doing his washing up duties chatted to some people who say they visit the site every year to take "les thermales" - he assumed they meant a local spa town but couldn't catch the name. June 24th, Day 23. Jonzac. Today a leisurely start - just managed to cycle in to Jonzac before the market closed. 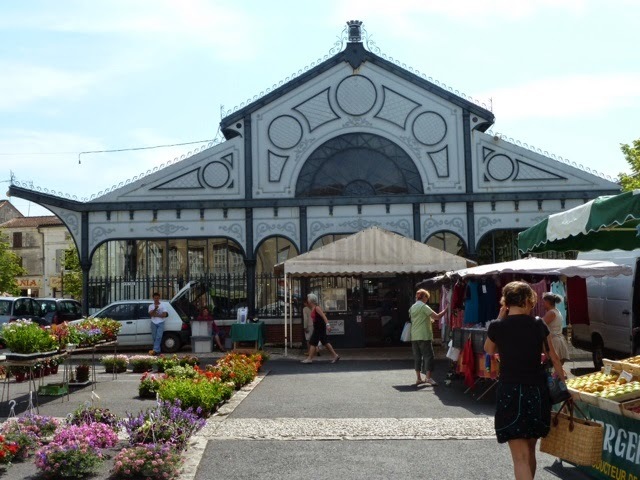 The Market is held in a rather spendid building. 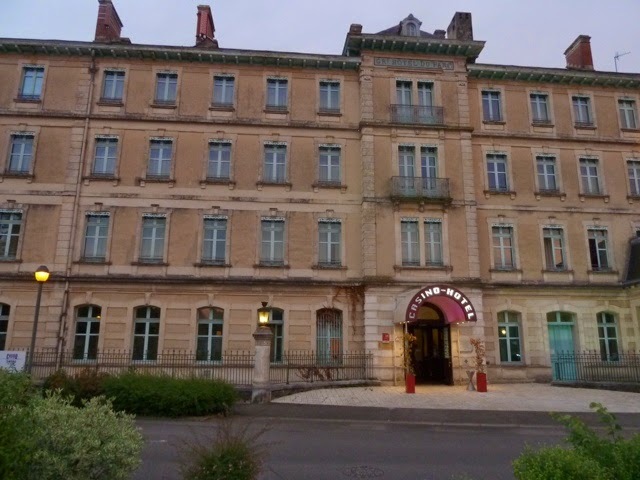 Jonzac has Thermes! it is a spa town! And it has a Chateau which is ...yes - The Hotel de Ville! 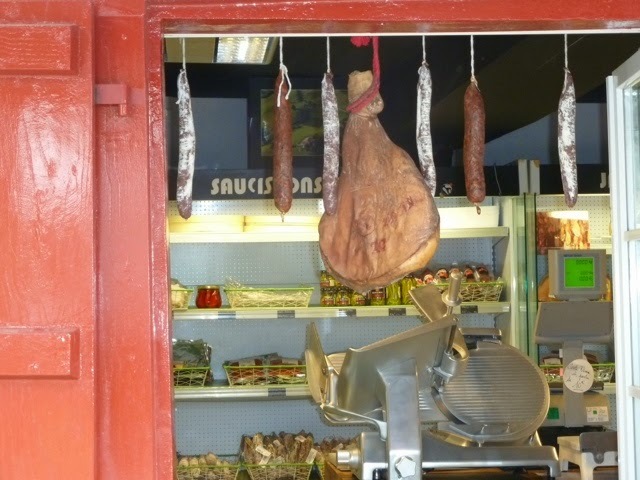 Bureaucrats sure know how to live in France! Jonzac is a lovely town which could be lovelier if the Marie banned cars from its centre and pedestrianised it. 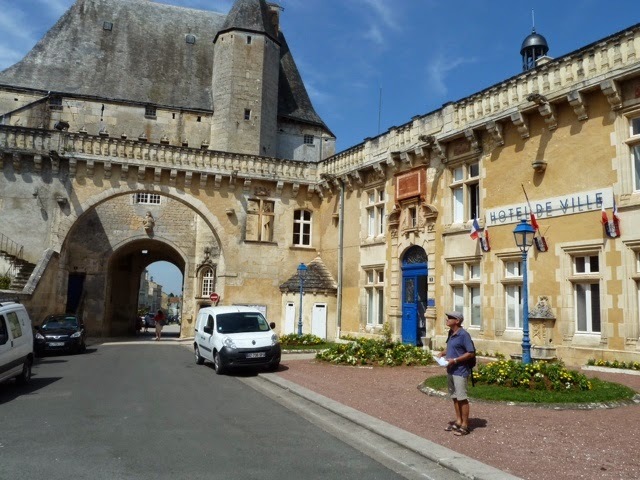 Why do the French persist in allowing cars into their historic centres? There appears to be many restaurants and shops in streets lined with rather grand looking town houses. 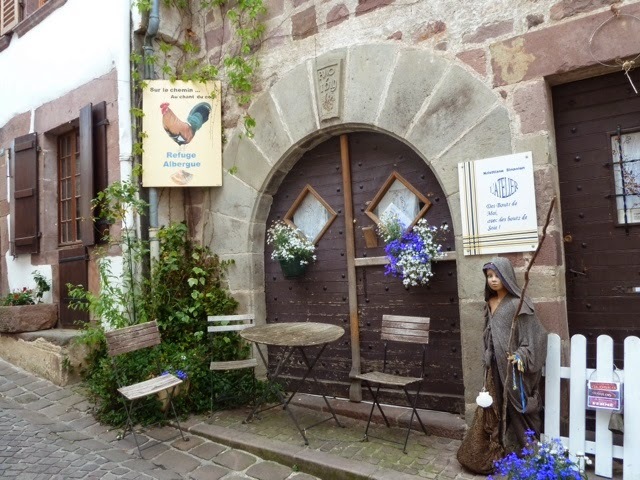 We decided to buy a ready meal from the Traiteur- 2 slices of Pate en Croute, a cooked chicken and some vegetables in a sauce -31 euros! After Carol scraped Graham off the floor, we cycled back to the site for lunch. The pate en croute was delicious! Had a chilled afternoon by the pool ,and later cycled back in to Jonzac where we visited a local wine shop and purchased a bottle of Pineau Charente (a cognac based aperitif - 17º) and a couple of bottles of local wine- after sampling some first obviously! A detour via Intersport so Graham could buy some tight swimming shorts, as his boxer/swimming shorts are deemed unsuitable in the swimming pool and he can no longer cope with the disapproving (or were they admiring? - Ed.) looks! Graham keeping well undercover in the pool! 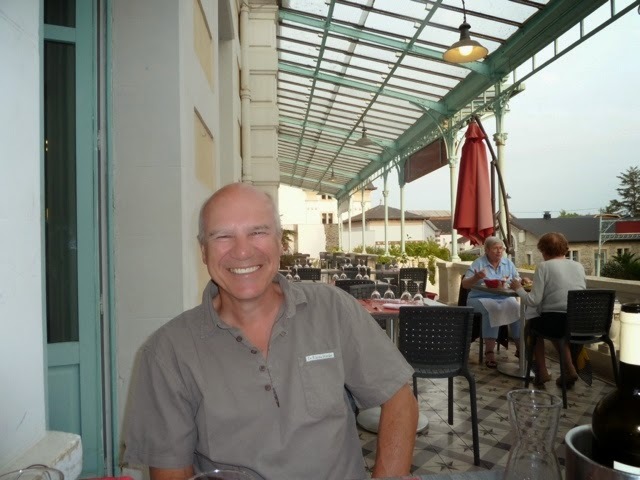 Tomorrow we will go further north up the coast to Royan, a place we have visited several years ago, to see if it has improved at all. It is driving distance to Pons -so also would be the nearest beach resort if we did decide to buy a property in the area. Weather windy but pleasantly warm still -23-24 degrees?